To begin with, click on Competencies. Click on Competency Plan Manager. 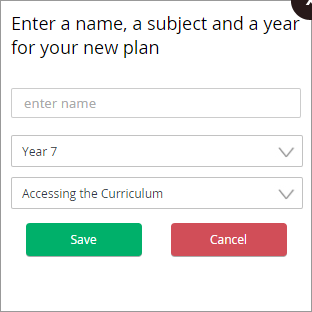 In the Competency Plan Manager you can view, create, amend and assign plans to year groups, subjects and classes. Click on the Add New Plan button. You will need to give your plan a name - for example, Year 11 English. You then need to select the Year Group that this plan will apply to. Next you need to select the subject. Click on the name of the newly created plan. You now need to set this plan up. 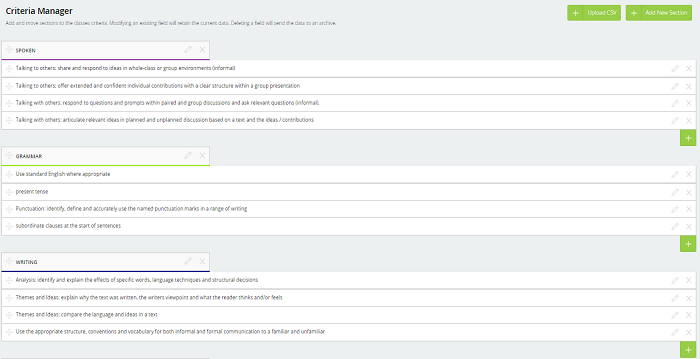 This will consist of adding Sections (areas of study) and Criteria (areas of assessment). Click on Add New Section. Enter a Section name, for example Reading. Then select a Colour and click on the Green tick to save. You now need to add all the relevant Criteria to that Section. To do this you will need to click on the Edit Criteria button which looks like a pencil. Click on this and then enter the criteria description into the new box, you can add a resource link if you wish. Click on the Green tick to the right to save the changes. You now need to continue adding Criteria until you have all that you need for this particular section. Click on the Add Criteria button and repeat the steps outlined above. Once that is completed, you will now need to create the next Section and add Criteria to that. Continue this process until you have all of the Sections and Criteria that you require. You have now created your first Competency Plan. Click on Save Changes. 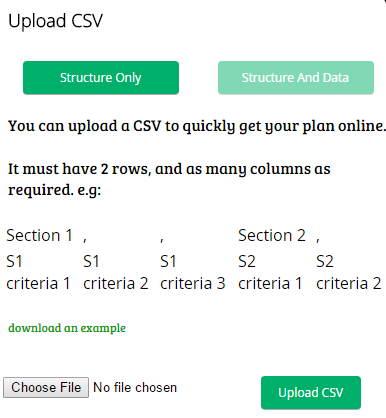 You can import competency plans if you already have them as a CSV file. To do this, click on Upload CSV in the top right hand corner of the screen. As long as the file you wish to import is a CSV file and the layout is similar to the one in the screen shot below, you can import it into MINTclass Competencies. Click on Choose File and then click on Upload CSV. Once you have created a Competency Plan, you will need to associate it with a class/classes in order for staff to use them. Select a Class from the list on the left - in this case, it is 11b/Ee1 - English. Click on Use This Plan. When a plan is a Master, it will then be visible to all staff for them to select and use. To make a plan a Master, click on Competency Manager and then click on Make Master to the right of the plan name. This will have now made that Competency Plan a Master.